Lack of female circumscision was probably the reason for Hanôkedöe Havva to be so unkindly teased. Female circumcision is a particularly barbaric custom still practised in many parts of the Arab countries and elsewhere in the world colonised by the Arabs. There is no evidence that it was practised in the Maldives in living memory. With the growing influence of mullahs in the Maldives and their attempt at recolonisation, there is no reason why it would not be reinstituted. "Narrated Umm Atiyyah al-Ansariyyah: A woman used to perform circumcision in Medina. The Prophet (peace be upon him) said to her: Do not cut severely as that is better for a woman and more desirable for a husband." Nadöalla is an island on the long coral reef fringing the western side of Huvadu Atoll. Takuru was born and raised in Nadöalla. His parents were poor, ignorant and backward people, so he received no schooling. From the time of his childhood he used to do menial works instead of learning how to read and write, and as time went by he became rude and illiterate. When he came of age, he realized the girls did not want to talk with him and that no one esteemed him. They said he was the poorest and least educated man in his island. But instead of accepting his fate, Takuru was unhappy, for he resented being despised by everyone. Having decided to put an end to his wretched condition, Takuru left his home island and sailed southwards to Adödöu Atoll. In the hope that his luck would improve, the young man tried staying in different islands, but nobody paid much attention to him and the only tasks they would give him would be mere rough, hard work. Takuru loathed toiling in unskilled jobs. What he longed for was to be respected and live a more refined life. But his way of talking was uncouth and he did not know any good stories or how to discuss interesting things, so he could not get along with the wealthier and more distinguished islanders. Hanôkedöe is an island between Abuhera, the narrow southern end of Hitadu Island, and Maradu. Now it is uninhabited but formerly there was a cluster of shabby dwellings there where the caretakers of the coconut plantation lived. Most trees on Hanôkedöe belonged to wealthy families of Hitadu and it is said that the caretakers there used to live in abject conditions of poverty. Finally he ended up in the impoverished island of Hanôkedöe. He settled there and climbed palm trees and harvested coconuts for rich people. Takuru became used to the hard work and meager income and lived in an untidy little shack, like everyone else in the island. He was quite depressed, because his lot had not improved at all since he had left his home island, "When I was living in Huvadu Atoll things were not worse than here," Takuru pondered. The storyteller acknowledged that the name given to this girl not only implied that Hanôkedöe was her native island.,There was also a certain unkind implication by others in Hanôkedöe regarding the dimensions of the periphery of Havva's genital orifice. In the Addu dialect, Hanôkedöe means "piece of skin". It was this unfortunate pun that was used to insult and embarrass Havva. But time went by and after three years of this dull life, he married a young woman named Hanôkedöe Havva. She was a dark-skinned and somewhat thickset girl. Since she had lived in the extreme poverty of all Hanôkedöe islanders, she was as steeped in ignorance and darkness as Takuru himself. And yet he liked her very much because she always looked at him with admiration in her eyes and this gave the young man a much-needed dose of optimism. Hanôkedöe Havva's genital condition was probably pendent labia minora a condition common in Bushman women of southern Aftica. One dark rainy night in their little miserable home, Takuru confided an ambitious plan to Hanôkedöe Havva, "I am only a poor man now," he told her, "but I have a plan for returning to my island in a few years rich and respected." Then he warned her not to tell anyone about it. The young woman agreed and duly kept the secret. Takuru and Havva lived humbly in Hanôkedöe for another year. They were quite happy if they could have ignored the limitations of their poverty. But all that time Takuru deeply loathed to be ever surrounded by the bunch of coarse people that lived in Hanôkedöe. His ambitions were set somewhere else and, with the exception of his wife, he treated everyone else in that benighted island with persistent contempt. Finally the day came when Takuru decided that it was time to prepare to move back to Nadöalla. A few months before leaving, he stopped shaving and began grow a long beard. One day he took all his hard-earned savings and went to Hitadu. There he bought beautiful white clothes for himself: a white shirt, a mundöu of the best quality and a finely knitted taìkiha (white skull-cap). Since there was no money left to buy clothes for his wife, Takuru told her to be patient. And even though she was quite poorly dressed, the young woman didn’t complain because her husband had explained her that this was part of his plan to become rich. When the Southwest Monsoon began to blow, Takuru took his few possessions and sailed with Hanôkedöe Havva on a northbound batteli back to the island of his birth. Reaching Huvadu Atoll, the boat stopped first at the island of Fiori. Takuru decided that it would be a good idea to try his plan right there before reaching his own island. Thus he donned his new white clothes, covered his head with his taìkiha and went ashore. Adopting a proud, aloof attitude, he informed everyone that he had just completed four years of studies in Arabia. The people believed him and were impressed. They invited him into their houses, and gave him good food and gifts. Takuru’s instant success took him by surprise and he concluded, "My plan really works!" But that same night Takuru was invited to take part in a Mauluìdu and he felt anxious. Right before going, when his wife was helping him to arrange his white clothes, he became a bit nervous and Hanôkedöe Havva reminded him, "you see it’s not always so easy." Knowing he must go or lose face, Takuru developed a bold plan of action and hoped for the best. That night the most venerable old men of the island gathered around him and sat down inside the haruge (shed). After a while, when everything was ready, Takuru was asked to begin the Mauluìdu. He swallowed his fear, and maintaining a dignified attitude, he began by chanting nonsense, combining Divehi words and Arabic sounds. In this manner he begins the same chant with the name of certain islands in Huvadu Atoll that are fancied to sound like Arabic (Diyadu, Nilandu, Funadu, Kandöuhuløudu, Daandu, Devvadu, Tinadu, Ratafandu, including some uninhabited islands too, like Meradu, Mahaddu, Haìdu and Maìdu). His poise was such that he convinced everyone that he knew what he was saying. Thus, Takuru fared even better than he had expected and was very satisfied with the results. Back aboard the next day Hanôkedöe Havva could not hide her delight and kept staring at her husband opening her eyes very wide in an admiring way. Takuru looked back at his wife’s sweet round face and felt so flattered he had to smile. Upon arriving to Nadöalla, his fame preceded him. The people on his boat had informed everyone that a very great and holy man was about to disembark. Thus, the men women and children of the island were waiting for him at the beach and Takuru didn’t disappoint them He caused a very good impression disembarking in his immaculate white clothes, striking a grave posture. During the months that followed Takuru managed extremely well. The islanders seemed to have totally forgotten his humble origins; now everyone had a high regard for him. The important people of the island sought advice from him, and often even asked him to lead prayers in the mosque. He was invited to recite religious chants in the houses of Nadöalla and other islands. He was always given choice food and gifts and treated with deference in the best households. In time Takuru became wealthy and influential, and Hanôkedöe Havva was very pleased with him. She enjoyed her status as a respectable woman, for she now could afford fine clothes and gold ornaments. Many years passed and Takuru and his wife lived very well and had children. But, inevitably, one day their happiness came to an end. Vadu island lies further east in the same atoll and it is reputed for its learned men and excellent navigators. A nakatteriya [astrologer/black magician- ed] from the island of Vaìdu, who was well-versed in Arabic, appeared one evening in Nadöalla right before sunset. Usually, whenever Takuru heard that an important person was expected in his island, he made an excuse to get firewood from a deserted island nearby. Thus he carefully avoided those who could have unmasked him. But this man was an unassuming person who arrived quietly and caught Takuru completely off-guard. The scholar entered a house while Takuru was chanting in a corner, pretending to read from a book opened on a wooden holder by a lamp. A sandalwood stick was burning in front of him. Carefully listening to Takuru’s chant, the learned man could hardly believe his ears. He wondered, "What is he reciting?" Going to stand next to Takuru, the man from Vaìdu glanced at the book and noticed that it was written in bold Arabic characters. "Were you reading this?" he interrupted Takuru pointing at one page of the open book. Having been respected in Nadöalla for years, Takuru replied "Yes," serenely and with arrogance. "You are an impostor!" declared the man from Vaìdu and began reading in clear and fluent Arabic from the same book. 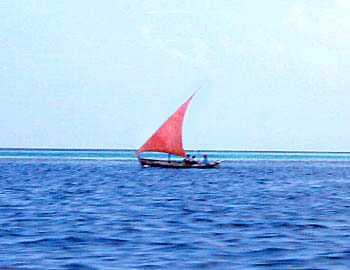 "I am on my way to Havaru Tinadu and I will tell the Atoll Chief about you." Suddenly Takuru’s expression changed. Filled with fear, he begged the learned man not to tell anyone. He told him about his sad and hopeless youth, hoping to warm the old nakatteriya’s heart. But the man was relentless in his resolve. He left the house and went about asking questions to find out more about Takuru from the people of Nadöalla. The next day the man from Vaìdu sailed to the capital island of the Atoll and spoke to the Atoll Chief, revealing the truth about Takuru: "There is a wretched man on the island of Nadöalla who claims that he is a learned person who spent four years studying in Arabia. The truth is that he actually spent that time in Hanôkedöe climbing coconut palms." The Atoll Chief sent a party of men to Nadöalla to find Takuru. They found him cowering in his home and brought him to Havaru Tinadu by force. After giving him a hundred lashes, he was sent back to Nadöalla unceremoniously. When Takuru was unmasked, Havva thought she would die of shame. Everyone teased and mocked her on the street and women and children made catcalls right by her house the whole day and a great part of the night, so she didn’t even dare to get out. Feeling deeply disappointed and betrayed by her husband, Hanôkedöe Havva left Takuru. One night while he was sleeping, the young woman furtively went aboard a doìni and sailed back to Adödöu Atoll without leaving any trace. Takuru would never see his wife again. He remained in Nadöalla the rest of his life in a state of dejection and despair. Even in his old age he was the poorest and least respected man of the island.